The First Horizon Zero Dawn Playtest Was "Absolutely Brutal"
A year before launch, Horizon Zero Dawn was received very poorly. One of the biggest highlights of the 2017 video game calendar was Guerilla Games' Horizon Zero Dawn. The open-world, adventure game swept plenty of awards and critical acclaim, but according to Guerrilla Games designer Eric Boltjes, the first playtest of the game was met with overwhelming negative reception. The story comes from this year's Game Developers Conference in San Francisco where Boltjes gave a post-mortem on the hit game. 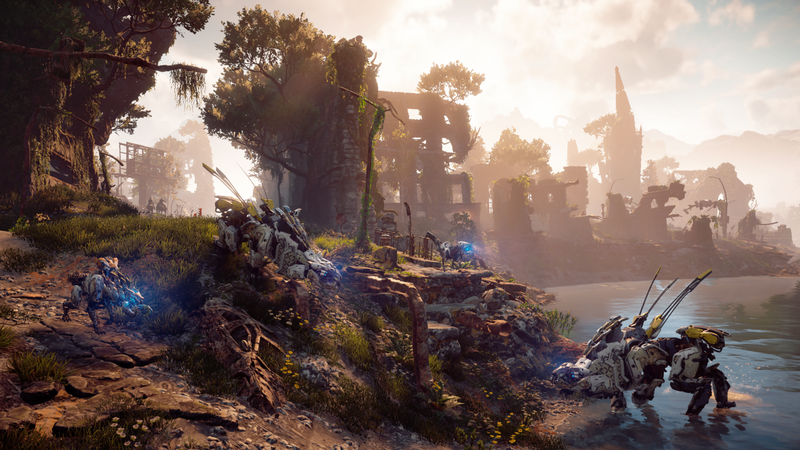 "It was absolutely brutal," said Boltjes on the responses and comments given to Horizon Zero Dawn during its first, five-day playtest where twenty players played through the full game in its entirety. What's more, this playtest was conducted less than a year before Horizon Zero Dawn shipped. "I truly felt panic," revealed Boltjes. "It's tough to read 'your game is boring' in capital letters. Especially since we brought this idea from scratch with so little to go off of." The talk Boltjes gave highlighted the growing pains the studio underwent as it transitioned from a series of successful, linear-narrative shooters to an open-world, third-person adventure game. According to Boltjes, playtesters cited bugs, major balancing issues, and even received core mechanics of the game poorly. The first playtest forced the team to take a step back and try and solve the issues the first round of playtesters highlighted as problems. However, some questions were left unsolved. Chief among them the resource economy in the game. "We really didn't fix this, we really failed," said Boltjes about the confusing resource economy. He said that because of the open-world structure of the game, the developers wanted a lot of resources to collect so that player could build better weapons and gear, but the importance of individual resources got lost in translation. Because of the mythos of the game and the alternate-history of the culture of the tribes in Horizon Zero Dawn, there was a "difference between the world language and the player language" that remained confusing. Still, Horizon Zero Dawn shipped to massive acclaim, proving that despite the initial playtest and resource management SNAFU. Guerrilla was able to zone-in on the big, key complaints and fix them before launch. And, as Boltjes says, learn a lot of valuable lessons for the future. Tagged with Action Adventure,	Guerilla Games,	News,	PlayStation 4. If dreams could become a reality. "Ride me as much as you ride your bike" has an explanation.